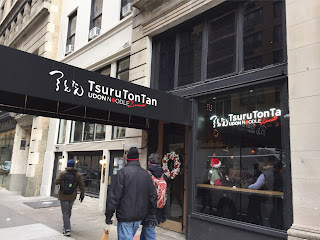 A friend of mine was going to Tsurutontan near Union Square and we joined her family to have lunch together. As she made a reservation, thankfully we could avoid the long wait which could be at least an hour after 1 PM on Saturday. They opened this restaurant at the end of August, 2016, and my friend said she'd heard that the wait was 2 hours. However, they started taking reservations, which is convenient, but till you have the complete group, you won't be able to sit. Like every other imported-from-Japan noodle shops, there're waiting space with bars, and actually this restaurant was quite spacious; there're tables in the lower level (only a few steps down from the ground), second floor and also towards the back of the space behind the bar area. 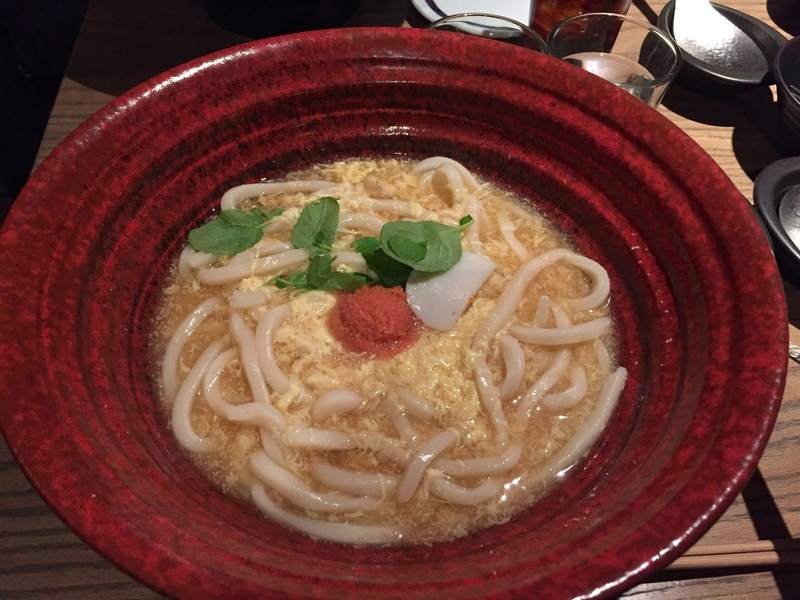 The menu seemed almost the same used in Japan, and I went through the menu last night and was decided to order "Mentaiko Ankake Udon." Mentaiko (明太子, めんたいこ) is a spicy cod roes, and Ankake (餡かけ) is a starchy sauce or dish. 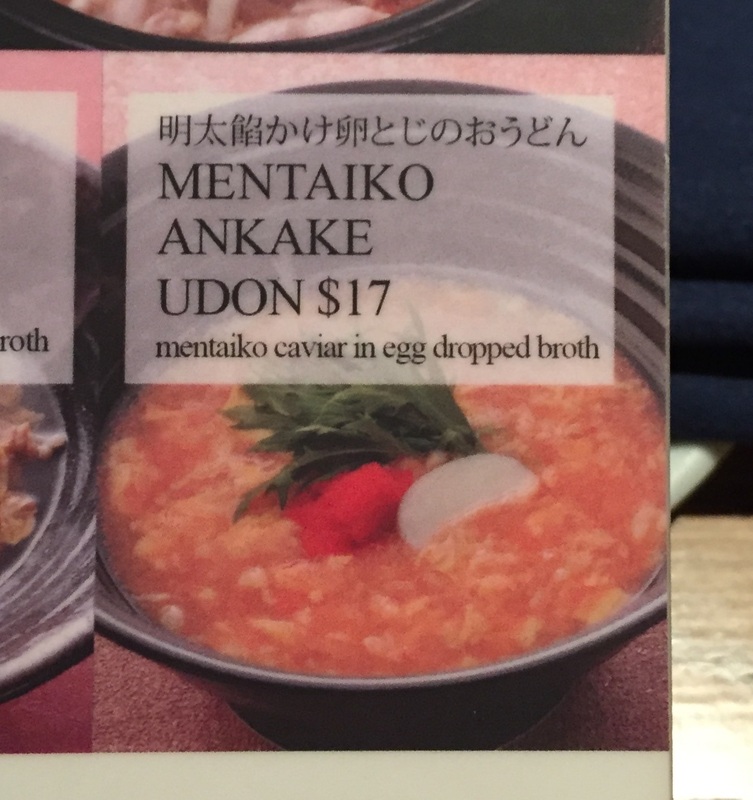 The same item is served at 1,280 yen (I think it's after tax) in Shinjuku Kabukicho location so that 17 dollars in New York didn't seem that bad, yet with tax and tip, it sure goes over 20 dollars. We could choose regular portion or large for no extra cost, and also thin or thick noodles. 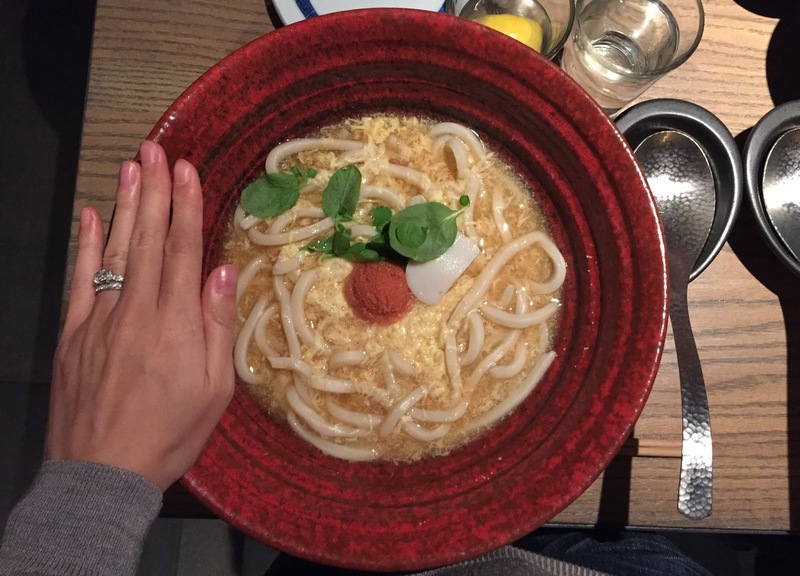 In Japan, you can choose up to 3 portions for free and thin and thick noodles also, thus, the system was also similar but less choices. 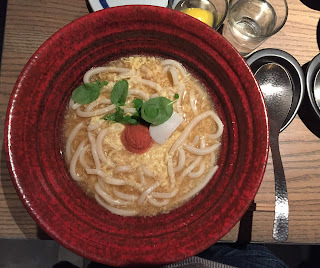 The staff said they'd not charge for the leftover noodles, but it's not allowed to take the extra noodles in the bowl home. The greens were supposed to be Negi according to the HP, but they tasted like watercress. 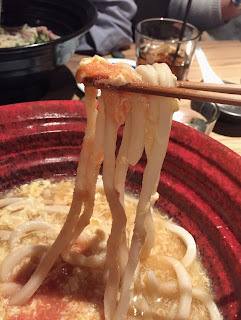 A scoop of red-orange dome is Mentaiko, spicy cod roes and the white half circle is fish cake called Kamaboko. Both the bowl and the spoon were as large as that served in Japan. My hand is about 17cm (6.69 inch). The soup was lightly rich as it's called "Ankake," starchy soup, and it's mixed with fluffy beaten eggs and smooth. The spicy cod roes were bright color at first, but once I stirred them into the soup, they became pale pink and I enjoyed the popping texture in my mouth. Thick noodles had great bite to it and chewiness, but at the same time, it's easy to bite off, which were the exactly same Udon noodles that I had in Japan. Still the wait seemed as bad as it opened, but I'd love to come back to try other items. * I was wondering if I could make a reservation for 1, but it seems like they don't take solo diner's reservation as any dates I clicked showed, "Sorry, we don't currently have any tables available for 1 person," while there're many slot for parties of 2 or more.